The question over the reliability of the Bible is one that Christians must deal with from time to time. However, I've found that there is just as much confusion from believers as there is from skeptics concerning this issue. One such point of confusion is the reliability of biblical texts. You know, I keep hearing that our Bible The "King James" version, is not necessarily the true and accurate version and that these new translations have searched and found a more accurate account of what is true. I have a very big problem with what has been said. First of all, if there are any errors in the Bible, then it is not the true Word of God. So when the Bible says that it is the inerrant Word of God, then that would be a lie. It also says to not add or take away from the book and that is being done. If we cannot believe that we have the one and only true Word of God without error then why even read it? I read on one of your articles that only a hand full of men translated the "King James" but that over a hundred translated the NIV. To me that makes absolutely no difference. God could use just one man, if he so chose to, so just to say that more men studied and wrote more about what is right, is null and void. God knew what we needed and used the men he wanted to use and it has to be 100% accurate or we may as well not believe any of it. By changing the Word of God (and the beauty of the words), there is confusion in the church. Who can follow along with what is being read and preached if there are dozens of different translations and why would we need God to speak to us about what he wants for us to get out of His Word if several different men are writing different versions of the Bible? We don't need a bunch of different versions, we just need to ask God to show us what he has for us in the verses that are being preached or when we read by ourselves. Besides these people are making millions of dollars by writing different versions and trying to make it easier to understand by their understanding. Not only that but it is a tool of Satan to keep confusion in the church and in the minds of the people. What about the versions that leave the blood out of the translation? It is playing with fire to mess with Gods Word and there is no reason to change it or try to simplify it. Hi and thanks for your concern. I appreciate your love of the Bible and your desire to follow God's word. But before we get too far into the discussion, I'd like to ask you a question. 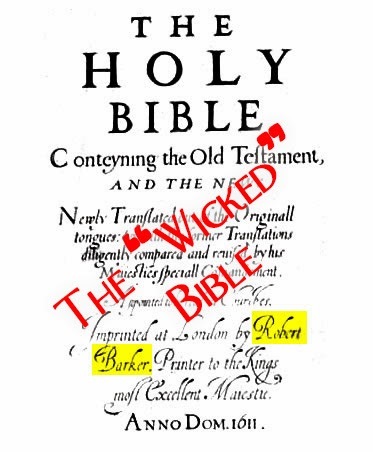 In 1631, Robert Barker published a version of the King James Bible, but when typesetting Exodus 20:14, he accidentally left out three letters. Unfortunately those three letters make up the word "not" so his version of Exodus 20:14 read "Thou shalt commit adultery." I am absolutely certain that Robert Baker had no malicious intent whatsoever. He made a mistake, that's all. My question: Is it possible that the King James Bible could have other mistakes as well, and if so how would we tell? My correspondent's answer was quick, although it missed the point of the initial question a bit. However, she did get to the crux of the issue. Thanks for answering my email. In my "King James" Bible, the word "not", is not left out, so where do you get your information? How can anyone believe that there are errors in God's Word? Which part then would you believe? Have you gone to the Lord to ask the truth of His Word? Just asking!!!!! Your question is a really good one. How can anyone believe there are errors in God's word? I for one don't. I believe that God inspired the authors to write the very words that He would have them write. I also subscribe to the Chicago Statement on Inerrancy. I make a big deal of this point in my article "Is The Bible Completely Error Free?" However, while the Christian church has always held that the original writings by the Biblical authors are inerrant, it has NEVER held that someone couldn't make a mistake in copying or translating the work. The Jehovah's Witnesses offer a distorted version of the Bible in their New World Translation. Wycliffe translators working with indigenous tribes have made may errors in translation, sometimes simply because they didn't know the language that well. Since we don't have any of the original writings, we need to go back and compare all the copies that we do have and make sure that the copies that have mistakes (like leaving out the word "not") are corrected. That is one reason why your copy of the KJV doesn't have this mistake. The original translators of the KJV didn't have nearly as many copies of the texts as we do today, and they didn't have as many early copies—copies that were less generations removed from the original writings. I hope you can see how all this makes a big difference in understanding inerrancy. Let me know if you'd like more detail about it. In a previous blog post, I showed the importance in asking questions in doing effective apologetics. Here is another example that allows for discussion while developing a rapport with your interlocutor. I'm not done with this exchange, though. In part 2, I go into a bit more detail as I continue my conversation. I hope you'll join us. Every word of the Bible in the original writings are breathed and motivated by God. Specific divine knowledge must be given to man since man is flawed. If God did not provide His instruction and guidance for us, then humanity would be left to guess what the true nature of the world is. But because we're flawed, our understanding of reality would be drastically different. As C.S. Lewis famously argued in Mere Christianity, "A man does not call a line crooked unless he has some idea of a straight line." Builders can build a house, but if they have no objective frame of reference, the house will never be true and plumb. Thus the doctrine of inspiration is a key one, for it tells us not only about God and how we can please Him, but also about our world and even ourselves. But what exactly does inspiration mean? This is the key understanding of scripture as presented in II Timothy 3:16-17: "All Scripture is given by inspiration of God, and is profitable for doctrine, for reproof, for correction, for instruction in righteousness, that the man of God may be complete, thoroughly equipped for every good work." 2. Scripture is given through prophetic agency. In other words, it is supplied to the writers by the Holy Spirit. This is made clear in 2 Peter 2:21 where Peter writes, "No prophecy ever came by the impulse of man, but men moved by the Holy Spirit spoke from God." 1. Packer, J.I. "The Inspiration of the Bible." from The Origin of the Bible, Philip W. Comfort, ed. (Carol Stream, Il. : Tyndale House, 1992) p.31. 2. Esposito, Lenny. "What Does It Mean that God "Inspired" the Bible?" The Apologetics Study Bible for Students. (Nashville: Holman Bible Publishing, 2010). 1312.